Product #17164 | SKU BDLKSDI4K | 0.0 (no ratings yet) Thanks for your rating! The Decklink SDI 4K Capture & Playback Card from Blackmagic Design features a single multi-rate SDI input and multi-rate SDI output. These multi-rate connections accept single-link SD, HD, 3G, and 6G-SDI signals, providing support for resolutions from SD to Ultra HD 4K (3840x2160) and DCI 4K (4096x2160). Additionally, the Decklink SDI 4K includes RS-422 deck control, internal keying, and a reference input. Decklink SDI 4K offers flexible format and system support, letting you work with compressed video formats such as ProRes and DNxHD, as well as 10-bit uncompressed video. When working with uncompressed video, all images are pixel-for-pixel identical to the source, without any generational loss. This lets you get sharper keying with green screens, cleaner compositions, superior colour correction, and more. Support for common file formats provides ready-to-edit files for use in popular editing, effects, and design software applications. 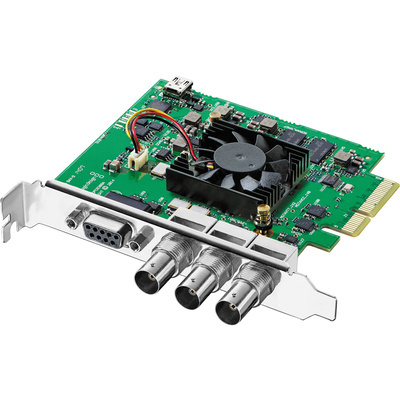 Decklink SDI 4K is compatible with Mac, Windows, and Linux based workstations.